It's a cruel trick that the glut of fruit and veg I might like to preserve comes just as I start back to school and have no time to do so. On the first day of term, my deputy head hauled in pounds of damsons and apples from her trees and I meant to pinch all the damsons and take them home for making jam at the weekend, but forgot. I asked her for some more on Monday, and she offered me plums instead - but they did not arrive until the following Monday. She was apologetic because there were quite a few that looked a bit past it, and I envisaged having to bin them all, knowing I'd have no jam time until the weekend. 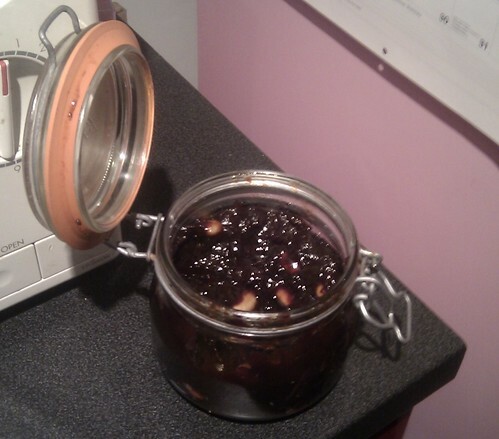 I briefly considered foregoing circuits on Monday and making jam instead. This was extremely tempting. My leg muscles were positively begging me to focus on preserving; but I'm possibly six weeks away from the ski instructor course (assuming it's not cancelled again) and the leg muscles must be trained. Then I found this recipe. It seemed too good to be true! Very busy girl friendly. I made it even more busy girl friendly by not cutting up or pitting them; since they were small, and the comments on the recipe said the pits float to the top, I thought I'd probably get away with it. It didn't take 16 hours. After 16 hours it looked like stewed plums, so I went back and read the comments, wedged the lid of the slow cooker open, turned it up to high, and left it another 10ish. I also fished out all of the pits and cursed myself for not doing this when I put the plums in; and I added some more sugar, because the stewed plums were on the tart side. After 10ish more hours, it looked like jam, tasted like jam, and I needed the slow cooker to make ratatouille with the courgette of enormity, so I stirred through some almonds (I meant to also add almond essence but couldn't find it at the right moment) and stuck it in a jar. It worked! Loving my slow cooker just a little bit more this week.